Has your heart been wounded? Are you going through dark times? If so, A P.A.T.H. to Enlightenment is for you. If you’re struggling to answer deeper questions—Why are we here? How do I become my best self?—or you’re simply looking for comfort in your day-to-day existence, this book is for you. 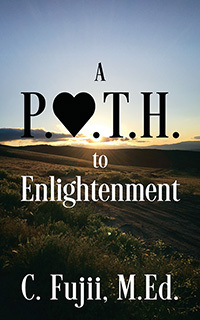 Find your inner Light, discover your Higher Self, and step out of the darkness with this short yet powerful book. You’ll learn how to shed your emotional baggage, forgive others, heal wounds, and let the Light of love into your heart! (Book of the year nominee) In today's world it is difficult to find comfort in the struggles of day-to-day life. This book is an attempt to answer some of the deep questions of life: 1. Why are we here? 2. What are we supposed to be doing? 3. What are the rules? 4. How do I win? 5. Why is life sometimes unfair? 6. Why does life seem to be a struggle? 7. What are the secrets of women? With 24 years of middle school teaching experience, C. Fujii has witnessed firsthand the effects of harassment, bullying, divorce, poverty, social inequality, and confusion during adolescence. A P.A.T.H. to Enlightenment, his debut book, asserts that by sending less pain and more Light into this world, we can reduce these social woes.